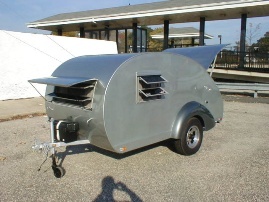 Rather than attempt to produce a perfect copy, this design follows the style of the original, but with a few differences: in particular, 9ft is an odd length - if the trailer is going to be longer than a sheet of ply, it seems logical to go up to 10ft. 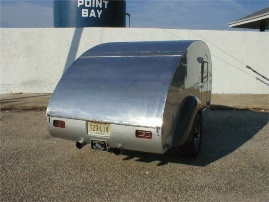 The design is 5ft wide, which appears to match the orginal trailer. 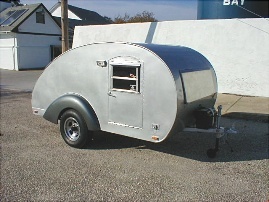 Because of the practical profile, there is a lot of floor length available inside the trailer and two alternative arrangments for the interior are shown: in the first, the length is used to provide a generous locker at the head of the bed while still leaving plenty of depth in the galley cabinets; in the second, the galley cabinets have been increased even further in depth, which would suit someone wanting a well-equipped galley with space to squeeze in a battery or water tank. 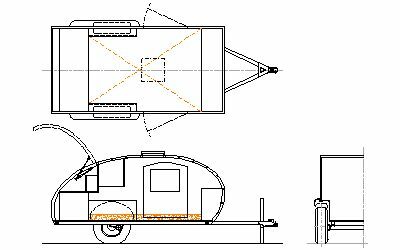 One feature of the original that has been retained in these drawings is the semi-recessed fenders - obviously the trailer could be built with surface-mounted fenders if preferred, though that would lose some of the trailer's visual appeal. 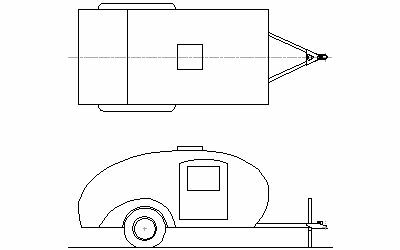 The price to pay is that the interior width is reduced between the wheel wells and the trailer needs a custom fiberglass fender to look like the original - the drawings also include a square-section fender that can be made from plywood. Download a zipped .dxf file. After some requests, here is (just) a profile of the Grumman shrunk to an overall body length of 8 feet. 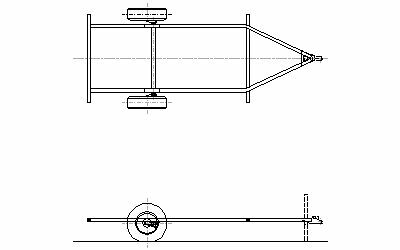 Note that the front and back curves mean this body is only 84” long at the base, so that a 4x8 trailer would have to have the last cross-member and the last foot of the side rails removed – though that would nicely ‘push’ the wheels backwards on the body.